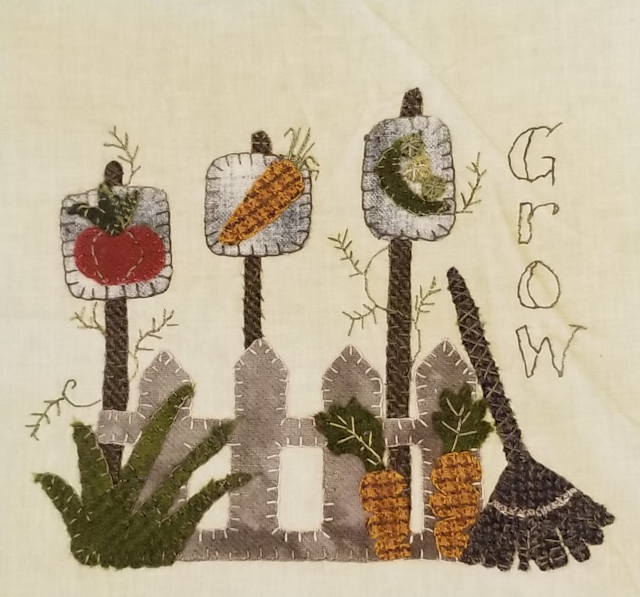 Today is the day we get to debut our Olde Green Cupboard Block 10 for the Farmhouse Threads and Friends Garden Mystery Quilt! We are so excited about the quilt this year.... I'm told we have close to 400 participating... with that great information I had to call my supplier and order more fabric. Thanks to Everyone for Participating!! Click on both links to print the complete pattern and full size template drawing. Be sure to print the template pattern in the horizontal setting for the correct sizing. When we were children - living on a small farm - we had a HUGE garden... and I mean HUGE! Plus a HUGE strawberry patch. All summer we helped... from planting, weeding, dusting for bugs, turning the melons so they would ripen on all sides (tip-toe through the vines), digging up potatoes, shucking corn, snapping beans, shelling peas.... oh my gosh.. I could just cry remembering how much work it was! Mom would plant marigold flowers all around the outer edge of the garden... she said it was to keep bugs away! I'm not sure it worked very well... I can still remember Daddy giving each of us a coffee can with a small amount of gas in the bottom, pliers, and gloves. We had the job of removing those nasty tomato worms from the plants. Ugh! In the can they would be tossed...only to be destroyed later! Then it would be time to help prepare all of the vegetables for canning. I sure wish I had a $1.00 for every ear of corn I shucked and a penny for every snap bean and pea pod I touched! After canning, mom would count the jars on the kitchen counter and table. She would say, 'Girls... we have 110 cans we need to listen for the jars to pop... help me to keep count"! When they were totally cooled the vacuum inside would make the metal pop giving the jar a good seal. We would eat those canned vegetables all year long until it was time to can more... all from our "Mystery Garden". Now that we're older... we would love to have a garden... but the sandy ground just doesn't do well with our growing.. plus it's so hot everything burns up. (although I am going to give a try with some tomato plants this year). My husband teases me... he says I surely do NOT have a green thumb. I seem to kill all the plants I get for the yard and house... so say a prayer for my future tomato plants. If they grow well and harvest a few, I'll take pictures and show you! Just think after our week... only two more to go! If you haven't started downloading your FREE patterns, you still have time! Did you see that word FREE???? Oh yes... so cool! Plus each designer has block kits for you to purchase... or you can make the quilt blocks with your own fabric and wool... your choice! March 30th, Joyce Weeks, Geoff's Mom Pattern Co. Please have fun with our block... hope it makes you smile and happy when you're "in the garden" !!! is there more than 3 free patterns? when I click on the links above I am only seeing 3 free ones. I love your designs I wish I could order them all, but living on disability I just can't . We're Home...Wow, What a fun trip! Have you signed up yet?? ?